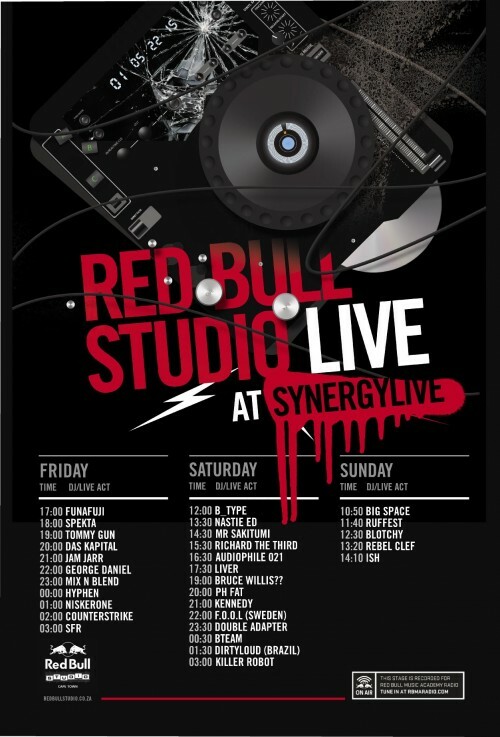 The last Red Bull Studio Live festival line-up for 2012 is as armed to teeth as ever. This time the we’re setting up shop at Synergy Live and with one of the world’s most revered Electronic acts, the Prodigy headlining, what better place to showcase SA’s Electronic Music champions. From peak-hour, crowd-surfing Electro-Thrash and Drum n Bass mania, courtesy of artists such as Haezer, Hyphen and Sfr, to Thug-tempo and Bass-bashing Step from the likes of Riot Squad and Mix n Blend, to day-time Headnod-happiness and 4/4 Hip-sway House from acts such as Christian Tiger School, Big Space and Thibo Tazz, the overall sounds of local Eletronica and Dance music will be repped by some of the best in the business. Combined with the aforementioned Dance-Music Gods on the main stage along with a line-up of essential-listening South African bands and acts, the first weekend of December will surely kick the festive season off on a high-note and if the Mayans are correct what better way to prepare for the world’s end by partying like its the end of the world. 23.30 – 00.30: Bruce Willis? ?